It’s actually the second time I’ve gone there. The first time was in the summer when I had some time off work. I’d gone on a Monday and hadn’t checked their website. They’re closed on Mondays. Disappointed, I went to the nearby Walmer Castle to have an overpriced pint. It was a very hot day and there were two men sitting at the table outside. I bought a pint and sat on a leather sofa in the back. After a while, one of the men outside came in and asked the barman if he had any sun cream. The barman, understandably, didn’t know why the hell this man was asking him for sun cream. He’s a barman in a pub, he doesn’t work in Superdrug. A couple came in with a baby in a pushchair. They parked the pushchair at the bottom of the stairs near where I was sitting and went upstairs. The baby was asleep. One of the men from outside – not the one who had asked for the sun cream, he was too ashamed – brought in the glasses and they left. Downing the last of a pint as you stride over to the bar and put your glass down is one of my favourite things in the world and I could tell this guy enjoyed it too. There’s something so reassuring about it. In that moment I know exactly who I am. Here I stand, a man. And here you stand, landlord of this fine establishment. We are men. We know our roles in society. I place my glass here and flick my eyebrows. You silently nod. No need for further dialogue. Everything we need to say is communicated by my eyebrow flick and your silent nod. We are playing our parts in this drama and we play them well. This could be any moment in history but it is today. Sometimes, when I’m feeling lonely, I’ll go into a pub and buy a pint specifically to enjoy this split second of intimacy; this passing bond. The two men left. After a couple of minutes, the mother of the baby came downstairs and checked on him. He was still asleep. She went back up stairs. Every five minutes or so, she would come downstairs to check on him. I realised there was a Thai restaurant upstairs. They were having lunch. They’d left their baby downstairs in a pub so they could have lunch. The barman went out a door at the back of the pub and a barmaid came in. She looked at me, and the baby in the pushchair and smiled. It occurred to me that she probably thought the baby was with me. It also occurred to me that the two people who had seen me go into the pub had left. Finally, it occurred to me that if I waited until the woman upstairs came down one more time, I’d then have a window of about five or ten minutes where I could steal the baby and be out of sight before anyone even knew anything was wrong. I wasn’t really sure what I would do with the baby. If I could get a taxi, I’d be well out of the area before the police were called, but then what would I do? I couldn’t take the baby home. How could I explain the fact that all of a sudden, I had a baby boy in a pushchair? In fact, I wouldn’t be able to do anything. I didn’t even want the baby. And yet, I couldn’t get the idea out of my head. I’d just finish my drink and walk out with the baby. A courteous nod to the barmaid. Everything is fine. I’m leaving now with my baby. A dialogue started in my head. Part of me planning how I would steal the baby; the other part, increasingly nervous, was asking if I was serious. “Just finish your drink and walk out with the baby” said one voice. “OK, but you are only kidding, right? You know you’re not actually going to steal the baby, don’t you? You know this is just some idle daydream” said the other. “She thinks he’s your baby anyway, she won’t think there’s anything wrong”. It’s safe to say that if I did steal the baby, my life would be changed forever. There would be no going back. I would be arrested, charged and convicted. At the trial, I would be unable to offer any defence or explanation for my actions. All I would be able to say is “I saw an opportunity”. I would go to prison. I would probably become a tabloid hate figure. My family would possibly disown me, my sister would definitely never ask me to babysit. I’d struggle to get a job. Nothing would be the same ever again. Sometimes I wish I’d taken that baby. As a father of 4-month old baby I think I can say without fear of contradiction that those people were terrible parents who probably deserved to have their baby stolen. There is the danger they WANTED to have their baby stolen and so wouldn’t have called the police anyway and I’d have been stuck with this bloody stolen baby. I was in a busy pub earlier in the year with friends. We say down at a free table and only then noticed that a pushchair complete with baby had been left next to it. It was ten to fifteen minutes before the child’s mother, who was sitting at another table on the other side of the room, came over to check on her infant. 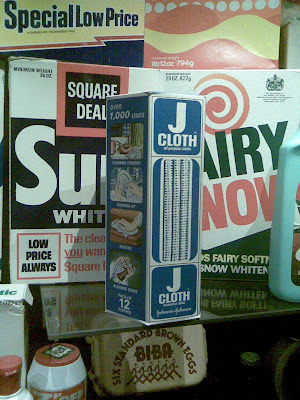 I could have stolen it and replaced it with a chimpanzee, and no-one would have suspected a thing. Why not make stickers that say “thinking of getting rid of this child? Ring today” followed by your phone number? That way you’d only get the truly unwanted ones. The thought of replacing the baby with a chimpanzee didn’t occur to me at the time. Also, if I’m honest, I’d prefer to keep the chimpanzee. 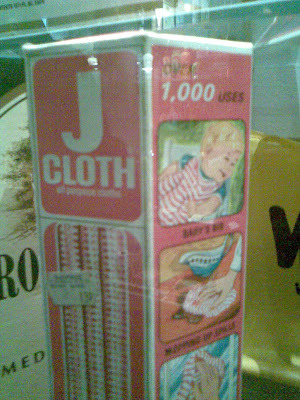 What I’m a bit worried about here is there was no mention made of j-cloths ‘over 1000 uses’ claim? Even the baby would chuckle as you made off. When my parents lived in Brooklyn in the early 50s, it was a “normal” practice to leave one’s infant in his stroller outside the butcher’s or the grocer’s while one shopped, especially if he was asleep and you did not want to wake him. Eek! Can you imagine doing that in today’s Brooklyn? Or anywhere for that matter? Scary. I was just trying to enjoy some Thai food in peace, man. Christ.